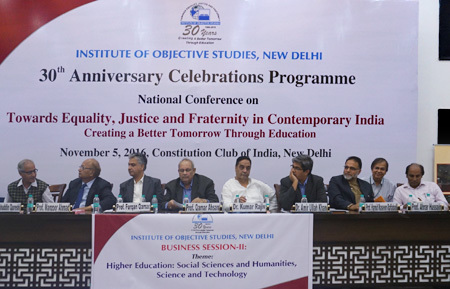 The Institute of Objective Studies organised a national conference on “Towards Equality, Justice and Fraternity in Contemporary India: Creating a Better Tomorrow Through Education” at Speaker Hall, Constitution Club of India, Rafi Marg, New Delhi, on November 5, 2016 to mark its 30th anniversary celebrations. 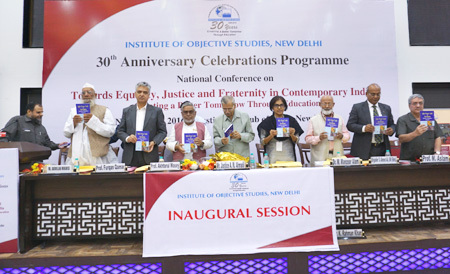 Inaugurating the conference, former Union Minister for Minority Affairs, K. Rahman Khan hailed the IOS for contributing its bit to the guidance of the younger generation by way of symposia, seminars and publishing about 400 titles on various issues that dominated today’s world. It’s work on the issues confronting Indian society as a whole would be written in the annals of history. Referring to the doubt being raised over the practicability of the Indian Constitution in certain quarters, he said that India was passing through a critical phase of its history. India has unity in diversity and it has adopted a Constitution that preserves this diversity. But that diversity was being sought to be undermined by intolerance. In this connection, he quoted a letter written by an ex-Navy chief to the Prime Minister, Narendra Modi expressing concern over the atmosphere of intolerance. The former Navy chief told the Prime Minister that the incidents of intolerance had put him to shame. 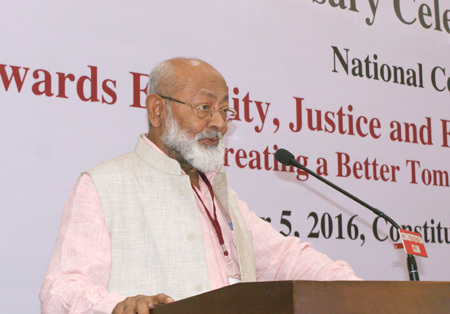 He noted that intolerance affected justice, fraternity and equality. The responsibility of initiating a dialogue on the issue rested on all, but the Muslims had a special role to play. This was so because earlier, too, the Jews did not accept the Prophet of Islam (PBUH) despite the prophecy about him in their scriptures. He warned against the impending danger to freedom of the press. This could be illustrated from the fact that telling the truth was immediately branded as an anti-national act. He also expressed astonishment over some of observations of the judiciary. Recalling the Karnataka High Court’s ruling that the birthday celebrations of the Mysore ruler, Tipu Sultan, could not be held at the state level as it was inappropriate to celebrate a ruler’s birthday, he said. The birthday celebrations of rulers were being organised at several places. Then why was Tipu Sultan being singled out, he questioned. Calling for urgent attention to education of the community for a better future of the younger generation, he said that the proposals for inclusion in the new education policy be forwarded to the government for some solace in today’s atmosphere of frustration. 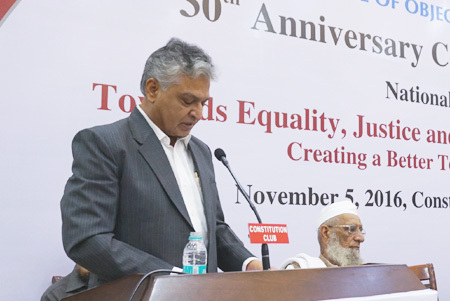 In his presidential address, former Chief Justice of India, Justice AM Ahmadi observed that 70 years had passed since the Constitution was adopoted. The basic features of the Constitution could not be changed due to the Supreme Court’s historic judgment in the Keshavanand Bharti case in which the apex court ruled that the Fundamental Rights formed a part of the basic features of the Constitution, and thus these could not be changed. No government that would come to power at the Centre in the future could subject the Fundamental Rights to amendments. 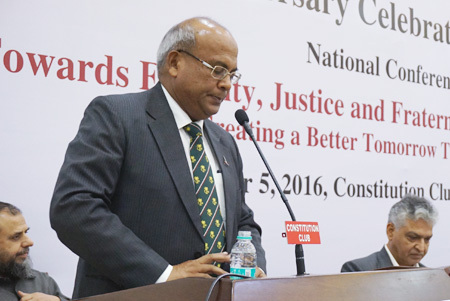 He urged young students of law to deeply study the Indian Constitution in order to correctly understand its spirit. Commenting on Article 23 of the Constitution, he said that it was the only Article that guaranteed the Fundamental Rights. Referring to Part Four of the Constitution, he opined that the Right to Education was one of the guarantees that ensured development of mental faculties of children, adding that education was the only source of enlightenment. He said that the Right to Education was supposed to be enforced within 10 years of the adoption of the Constitution, but it was not to be. He insisted that though education was there in Part Four of the Constitution, he always felt that it was one of the Fundamental Rights. During his tenure in the Supreme Court, he thought that the time was ripe to enforce the Right to Education leading to the passage of Right to Education Act, under which education for children from 6 to 14 years had been made free. Rejecting the logic that lack of finances was coming in the way of education, he urged Muslim leaders to convey the message to the community that each and every child should go to school. He recalled how he wrote to the chief ministers to open institutions of higher learning in their states and said several of them were receptive to the idea. The establishment of the National Law University in Bangalore, of which he was Visitor, was such an example. He concluded that young men possessed talent and what was needed was encouragement. 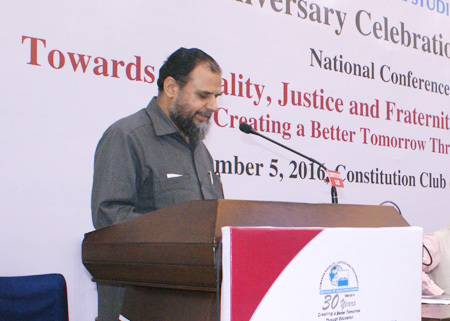 Former Union Minister of State for Communication and Information Technology, Dr. Shakeel Ahmad held that the responsibility to enlighten the younger generation devolved on intellectuals. He lamented that Muslims neglected history, with the result that they moved away from Islam. The number of mosque- going Muslims did increase, but Muslims abdicated their duty to engage with non-Muslims. This obviously led to misconceptions about Islam among non-Muslims. Emphasising the need for inter-community dialogue for putting Islam in proper perspective, he said that the wrong notion of the use of sword for the spread of Islam could be dispelled. He maintained that if the sword had been wielded for the spread of Islam, in Agra and Delhi, which were seats if power of the Muslim rulers, the entire population would have been converted to Islam. He also took to task those non-Muslims who dubbed Muslims as sympathisers of Pakistan adding that both the Pakistani intelligence agency, ISI, and a particular party in India rejoiced over communal riots. He expressed surprise that in a democracy like the United States of America which claimed to be strongest in the world, the Republican candidate for presidency, Donald Trump, could use hatred against Islam as a bait for winning elections. Vice-Chancellor of Maulana Azad University, Jodhpur, Prof. Akhtarul Wasey observed that the IOS was established at a time when the need for a think-tank was strongly felt. 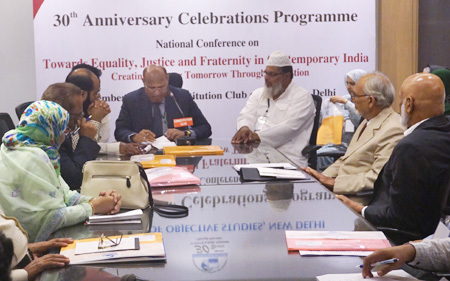 It was a happy augury that the delegates to the national conference were participating cutting across religious and caste lines to deliberate on the issues that confronted not only Muslims but also other communities, he said. 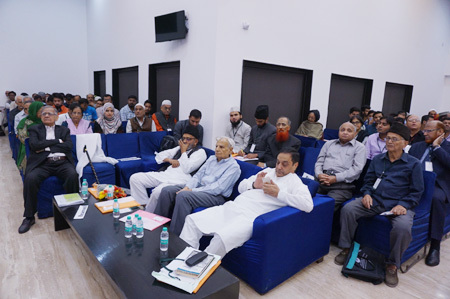 Former Vice-Chancellor of the Central University of Himachal Pradesh and General Secretary, Association of Indian Universities, Prof. Furqan Qamar stressed that Muslims should go into the causes that led to educational backwardness among Muslims. Calling for creation of educational facilities, he said that colleges and universities should be opened for Muslims to pursue higher studies in different disciplines. These facilities must be made inclusive for the development of the community. The existing rate of Muslim participation in education, which stood at 29 percent should be raised in urban and rural areas. Despite facilities, quality education was lacking, he said. Inclusiveness created diversity which served as a catalytic agent for the augmentation of knowledge. He explained that there were two barriers to educational development. These two were, actual barrier and perceived barrier. These barriers should be removed to create educational opportunities for those who did not possess them. 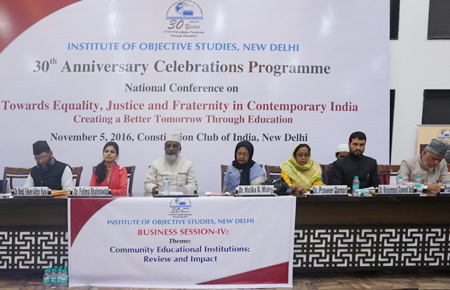 Pro-Vice Chancellor of Aligarh Muslim University, Brigadier S Ahmed Ali, SM, pointed out that education was a key to national development. Expressing concern over the highest percentage of school drop-outs among Muslims, he said that it was time to do some soul-searching. Commenting on quality education, he held that it was a benchmark of Christian schools. Thus the Muslim educational institutions too should not compromise on quality. He said that education inculcated a sense of value among students as without value, ethos would be meaningless. He extensively quoted from statistics on meager outlay on research and development in education. He remarked that the rate of drop-outs among Muslim students stood at 57 percent against the national average of 65 percent. This rate was higher in states like UP, Maharashtra and Jharkhand. He counseled the younger generation to learn to labour and wait. Vice-Chancellor of the Indira Gandhi National Open University (IGNOU), Prof. M. Aslam called for introspection and said that it was difficult to build an institution. While laying stress on the exchange of experience among scholars, he said that the focus should be on marginalised sections. 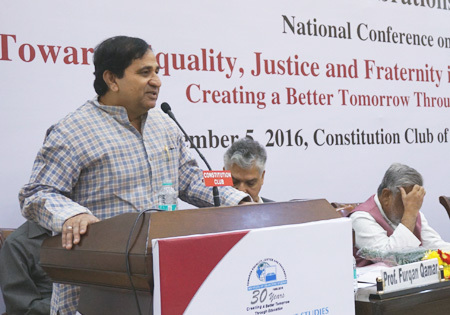 There was also the need for strengthening constitutional values. 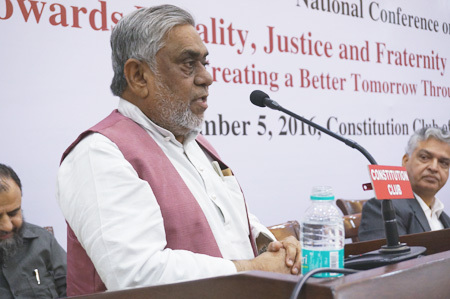 Commenting on the Indian Constitution, he said that legal experts were required to interpret the provisions. He held that good sense prevailed over the government to formulate a realistic education policy. He lamented that administrative structures were not functioning properly and were turning to judiciary for instructions every now and then. He also regretted that social institutions were disintegrating and India was not paying any attention to them. Pleading for investment in education in future, he said that several European countries were spending less on arms and more on education. 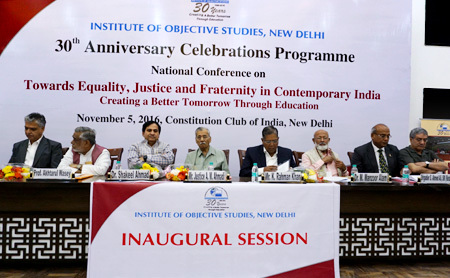 Chairman of the IOS, Dr. M. Manzoor Alam briefly dwelt on the 30-year journey of the institute. 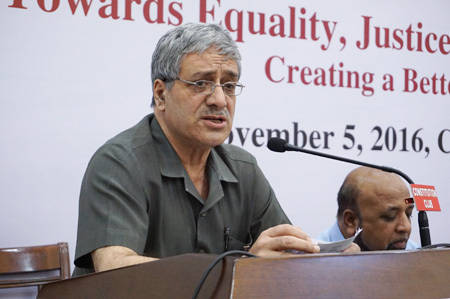 During this journey, the institute focused on justice, equality and brotherhood. He said that these three elements were at the core of the holy Qur’an as well as the Constitution. But, Muslims had miserably failed to act according to either of the two. It was in this context that the IOS had so far organised about 1,100 national and international seminars. He informed that about 30-40 books on these subjects were in the pipeline. Similarly, a project, under which the study and analysis of victims of various sorts would be undertaken, had been prepared. He recalled the days when he faced opposition from several quarters and nobody was willing to give the institute its space. He especially called upon the youth to read into the future and not get desperate due to the prevailing atmosphere. Despite desperation, they must tread on the path of education, social harmony and forbearance. They should work at the ground level in order to be fully awakened about the issues at hand and share their concern with others. The country belonged to the younger generation and the onus to save the nation devolved on them. 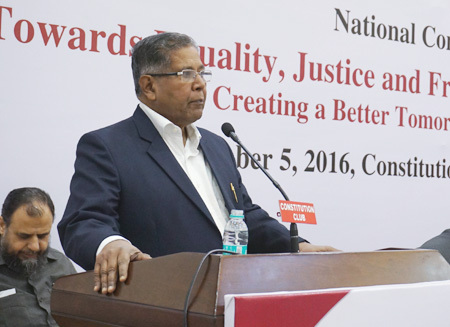 While calling for intellectual work to be taken forward, he said that social and economic equality should be vigorously pursued. 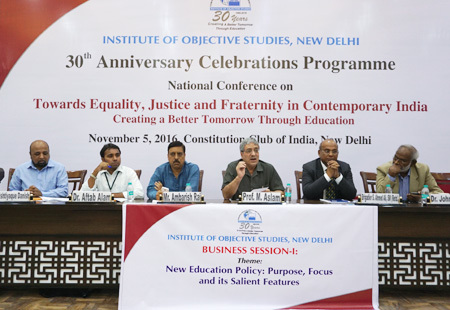 The session presided over by Vice-Chancellor of IGNOU, Prof. M. Aslam, focused on “New Education Policy: Purpose, Focus and its Salient Features”. This was conducted by Finance Secretary of the IOS, Prof. Ishteyaque Danish. The speakers at the session included national convener, RTE Forum, Ambarish Rai, eminent journalist and Human Rights activist, Dr. John Dayal, Pro-Vice Chancellor of AMU, Aligarh, Brigadier S Ahmed Ali and Asstt. Prof. of Political Science, Zakir Hussain College, Delhi University, Dr. Md. Aftab Alam. The theme of the Session was “Higher Education: Social Sciences and Humanities, Science and Technology”. Co-chaired by the Vice-Chancellor SK University, Dumka, Jharkhand, Prof. Qamar Ahsan, and former Vice-Chancellor of the Central University of Himachal Pradesh and General Secretary, Association of Indian Universities, Prof. Furqan Qamar, the session was conducted by Dr Md Aftab Alam. The speakers included former Vice-Chancellor, Swami Vivekanand Subharti University, Meerut, Prof. Manzoor Ahmad and former Vice-chancellor, Maulana Azad University, Jodhpur, Dr Kumar Rajiv. While Prof. Hamid Naseem Rafiabadi, Dean, School of Social Sciences, Central University of Kashmir spoke on “Empowering Education with Values: An Integrated Model”, Dr Amir Ullah Khan, Advisor, Gates Foundation and Visiting Professor, Indian School of Business, Hyderabad and Prof. Ahrar Husain, from the Faculty of Education, JMI focused their talk on higher education. Former Chairman, Deptt. of Geography, AMU, Prof. Salahuddin Qureshi spoke on “The Problem of Standard of Books in Higher Education” while Prof. M Badrul Alam, Political Science, JMI spoke on the theme. Mohammad Allam, post-graduate teacher in St. High School, Aligarh spoke on “International Ranking of Indian Institutes of Higher Education: An Analysis” while Mohammad Asif, asstt. prof., deptt. of Education, Tezpur University, Assam also expressed his views on the theme. The third session was devoted to “School Education: Critical Areas of Concern”. While the session was chaired by the principal, the New College Chennai, Dr. Major Zahid Husain, it was conducted by Abdul Basit Ismail of Jibreel International School, Kolkata. The speakers who presented their papers included former chairman, deptt. of Economics, AMU, Prof. Nasim A. Zaidi, asstt. prof., deptt. of Psychology, AMU, Dr Nasheed Imtiaz, managing director, SATCO, INTL, Qatar, M S Bukhari, research scholars, deptt. of Islamic Studies, AMU, Zubair Hamid and Mujtaba Farooq. The fifth session on the “Minorities and other Marginalised Sections and Dalit Education and Way Forward” was chaired and conducted by Dr. Kumar Rajiv and Prof. Hamid Naseem Rafiabadi respectively. 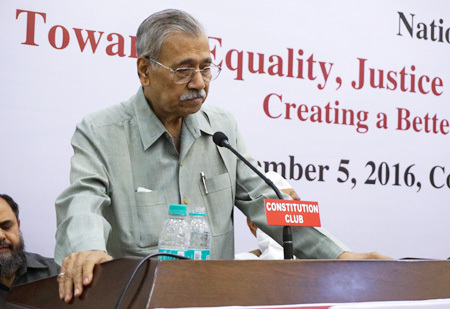 While Prof. Shamim A Ansari, dean, faculty of Psychology, AMU, spoke on “Strategic Roadmap for Educational Empowerment of Weaker Sections, especially Muslims: A Key to Success”, human rights activist, VB Rawat expressed his views on the theme. Sanjay K Rai, general secretary, Asangathit Kshetra Kamgar Union, U.P. 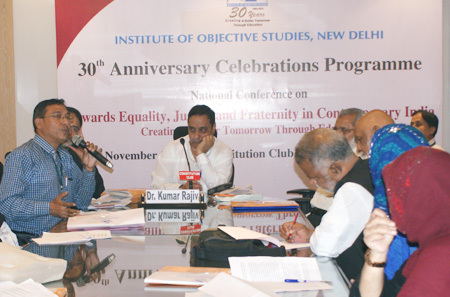 Lucknow presented a paper on “School Education – Minorities and the Marginalised”. Dr. Showkat Ahmad Dar, research scholar, deptt. 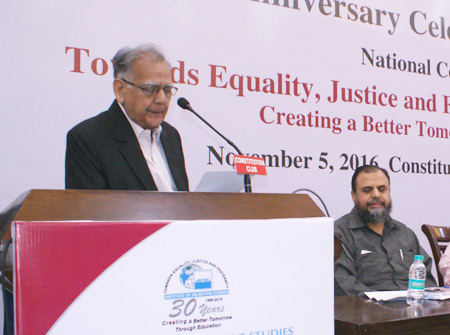 of Islamic Studies, AMU, presented a paper titled “Towards Upliftment of Underprivileged Sections of Indian Society”. Sajad Ahmad Padday, research scholar and Dr. Ayesha Siddiqua, post-doctoral fellow in the Deptt. 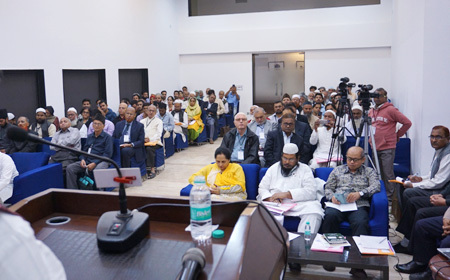 of Islamic Studies, AMU, presented a paper on “Muslim Awakening in Modern Education”, and “A Comparative Study of Educational Condition of Muslim Dalits and Hindu Dalits in India”, respectively. 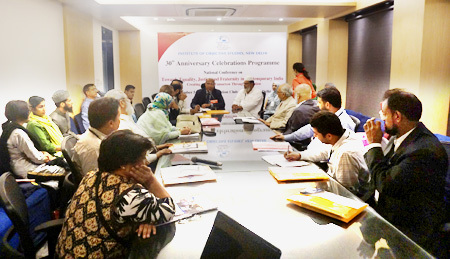 The fifth session was followed by the valedictory session, which was presided over by Dr. M Manzoor Alam. In his concluding remarks, he said that several suggestions received at the conference on various issues would be discussed by a committee and a decision would be taken. He remarked that Dr. Mohd. Fahim Akhtar Nadwi’s suggestions would be discussed by the general body of the IOS. Referring to the national seminar organised on inter-faith harmony in Bodhgaya in the last week of September, he said that the governor of Bihar was impressed with it. The governor had asked the state universities to organise such seminars in association with the IOS. He informed that about 130 books on the subject of inter-faith harmony had been planned. He called upon young scholars, both Hindus and Muslims, to come forward and fight against negative thinking with their writings. As justice, equality and fraternity formed the core of both the holy Qur’an and the Constitution, young intellectuals and ulema should take a lead in identifying those who were working against the spirit of the latter. He held that scholars associated with the RSS were deeply involved in the study of the Qur’an and Hadith with an intent to misguide people by mis-interpreting them. It was now duty of the ulema and Islamic scholars to present the teachings of Islam in a proper perspective in different Indian languages. It was high time both Muslims and Hindus joined hands for neutralising ill-effects of the false propaganda of the Sangh Parivar as the Quran was revealed to the Prophet (PBUH) for the well-being of the entire humanity, he added. Earlier, the national conference formally opened with the recitation of a Quranic verse by the Islamic scholar, Maulana Abdullah Tarique. In his welcome speech, Prof. ZM Khan, Secretary General said that the IOS was engaged in looking into the various aspects of education and the new education policy, besides focusing on the marginalised, deprived and poor sections of society. He pointed out that the Institute also undertook field researches on various subjects through scholars. Epistemology was one of the areas where the Institute had done a lot of work. The Institute employed a methodology to select scholars for assignments. The Institute was planning to undertake the study of the role of the common in the freedom movement, he concluded. On this occasion, seven books and reports and a calendar for the year 2017 published by the IOS were released. While Status of Muslim Education and the Way Forward , a report by Ms. Naaz Khair was released by Prof. M. Aslam, Indo-ASEAN Trade and Investment: Historical and Contemporary Perspective by Dr. Asmer Beg was released by Justice AM Ahmadi. IOS Vice- Chairman, Prof. Refaqat Ali Khan released, Ba-Yaad-e-Shibli written by Dr. Alauddin Khan. Mashahire Uloom-e-Islamia aur Mufakkereen wa Musleheen by Prof. Mohsin Usmani was released by Prof. Akhtarul Wasey, Indo-Arab Relations: Partnership in Development written by Dr. Tahir Beg was released by Prof. Furqan Qamar. Youth Education and their Career Perspective: A Case Study of Jamia Nagar (Delhi), a report by Dr. Razia was released by Brigadier S Ahmad Ali. While Hindutva: Ahdaaf Wa Masayal written by Maulana Abdul Hameed Nomani was released by Maulana Abdullah Mughesi, the IOS Calendar for 2017 was jointly released by the dignitaries present on the podium. The proceedings were conducted by the Asstt. Secretary General, IOS, Prof. Afzal Wani. Dr. M. Manzoor Alam proposed a vote of thanks. The inaugural session was followed by the inauguration of an exhibition on IOS journey through last 30 years. 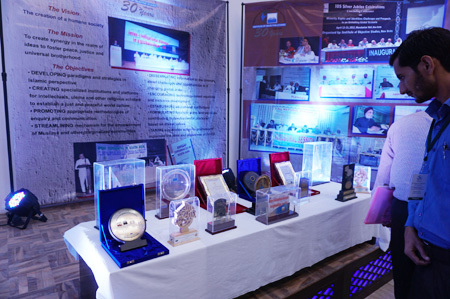 The exhibition contained display of audio-visuals, publications, hoardings and banners, calendars, clippings of news and articles and films and photo galleries of important events of the IOS during last 30 years. A careful watch is to be kept to see to it that constitutional guarantees in regard to equality, justice and fraternity are safeguarded by all. All efforts at commercialisation of higher education are to be analysed and taken care of. All sections of society must ponder over different aspects related to the theme and self introspection and soul-searching have to be done by all. It is a question which addresses the fate and future of India as a nation and civilisation. The call in regard to the questions related to education should be raised at national level, including marginalised section. Maybe, it takes the form of a powerful movement. Different aspects and issues should be studied and analysed in an organised form. A comparative study would be more meaningful. It is urged that the government should increase funding to education. At least, six percent of budget allocation should go to education. Efforts should be made to create opportunities to get quality education. The educational institutions should try to raise the bar of excellence. Those who are concerned with questions regarding education should not give up and continue with their campaign and struggle for it. Education leadership is to be created to struggle for improvement of education. Marginalised sections must also learn to put in labour through planned efforts. National interest demands that aggressive and others similar shades of nationalism must be resented and stopped. Education has a wider scope and dimensions, so it has to be highly inclusive. Special efforts should be made for female education at all levels. All efforts are to be made to remove perceived and attitudinal barriers. There should be an effective mechanism to monitor administrative structures relating to education. Such mechanism should be created with a view of its practical utility. There should be serious efforts to mingle and coordinate industry and education. Community education system should be reviewed by madaris themselves. Steps must be taken to incorporate madaris with university system.